Rosemary oil is another healing oil that is well suited to oily prone skin. Not only does it clear the skin, it is also used in aromatherapy to clear the mind. It is said to sharpen the mind and increase mental alertness. Origin and Description: Native to the Mediterranean Rosemary is a shrubby evergreen with grayish green needle shaped leaves that can grow 4-5 feet tall. It produces pale blue small flowers. In the middle ages rosemary was burned to help fight off the plague. The main producers of Rosemary are Spain, France and Tunisia. Part of Plant Used: Rosemary Essential Oil is obtained from the flowering tips of the plant through steam distillation. Aroma: Strong, herbaceous, fresh, woody, kind of minty scent. 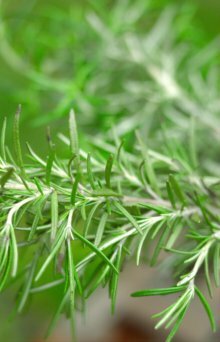 Skin Care Uses and Benefits: Rosemary has antibacterial and antiseptic properties making it good for acne, eczema, dermatitis and oily skin. It clears pores and promotes healing improving the appearance of skin. High in antioxidants and because of it being a natural astringent Rosemary is also very beneficial to aging skin. It increases blood circulation to the skin's surface, smooths the appearance of wrinkles, tones, moisturizes and can help with the treatment of scars and sun damaged skin. Rosemary Oil blends well with following oils: Bergamot, Clary Sage, Eucalyptus, Frankincense, Geranium, Grapefruit, Lavender, Lemon and Tea Tree oils. Cautions: Do not use if you are epileptic, suffer from hypertension or are pregnant. If in doubt always consult with your doctor.